You can set the hours that your business is open and closed so that when you are closed your calls go directly to your voicemail. You can set different times for each day so that if you have an early day closing or close over the weekend your phones can match your working day. You can change your hours any time you like and as often as you like from your Control Panel on our web site from anywhere. It comes free with the Virtual PBX. 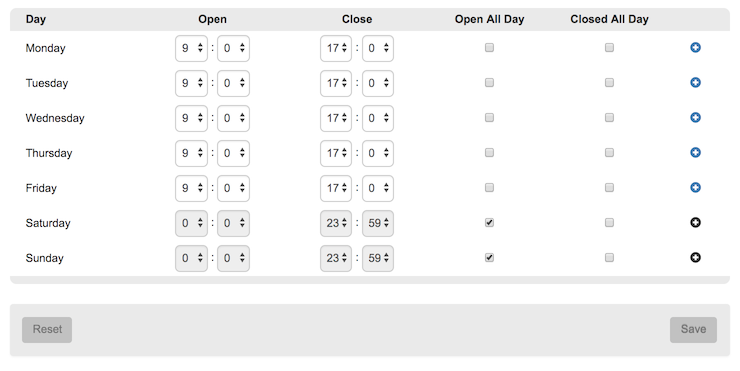 Go to the business hours page and you will see that you can set the time you are open each day using the drop down menus. Use the tick box for when you are closed all day. The default setting is to be open all day. Log in to your online control panel to configure your services. With Voipfone’s Online Control Panel you can manage your account in real time, from your PC anywhere in the world. You can speak to one of our Customer Service representatives by calling our dedicated Customer service line on 020 7043 5555 and we will be happy to answer any questions you have.